Obesity is on the rise in Singapore, with 40% of Singaporeans overweight or obese, mostly because of unhealthy lifestyle habits. More and more people are overeating and eating out. Majority are also exceeding their daily salt intake. While most Singaporeans recognise that eating out is not as healthy as home-cooked food, most are not necessarily doing much about it. Home-cooked food is where the families can have the greatest control over what ultimately gets into their stomach. Cooking at home does not only support healthy eating, it also promotes family bonding. Hence this contest is to encourage healthy eating within families and also showcase that healthy cooking can be easy, fun and creative. A family that cooks healthy together stays together! Plus, eleven (11) consolation prizes of vouchers worth $100 each. 1 Photo of your Healthy Dish along with your recipe. 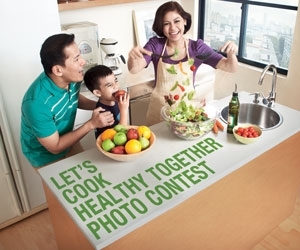 Submit an additional Photo of you and 2 to 4 family members or friends cooking together for 5-20 Bonus Points! Established in 2001, the Health Promotion Board (HPB) has a vision to build a nation of healthy people. Although residents in Singapore today enjoy good health with high life expectancy and low mortality rates, we want to further improve our health status and continue to enjoy good health as we age. To achieve this, HPB assumes the role of the main driver for national health promotion and disease prevention programmes. Our goal is to increase the quality and years of healthy life and prevent illness, disability and premature death. Please remember to upload your Food and Family photos in .jpg format! This entry was posted in Photography Contests, Uncategorized and tagged Photography Contest. Bookmark the permalink.